In late Summer of 1970, when Frank Gormlie, Bo Blakey, and John Lyons decided to publish the first issues of the OB Rag, their motivations stemmed from the very idealistic politics they had formed in the crucible of the top university of the state, an idealism steeped in a campus brew of counter-cultural and militant leftist politics. 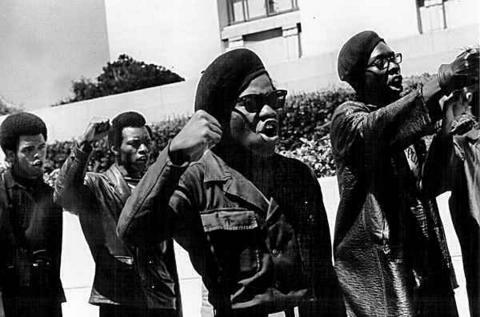 Lyons and Gormlie from UCSD, and Blakey from UC Berkeley; all had been involved in the campus anti-Vietnam war movements, each had been deeply affected by the anti-racism that swept American college campuses during the late sixties, and each could be called a “long-haired, dope-smokin’ radical” by detractors and friends alike. All three had been members of – or at least had attended meetings of – Students for a Democratic Society, SDS, the major nation-wide organization of new-left students and anti-war activists. Lyons and Gormlie, in addition, had been in classes taught by Herbert Marcuse, one of the most foremost and world-renown new-left philosophers, then in his seventies. Marcuse’s grad students — who included Angela Davis — were instrumental in the local anti-war movement on campus. (Beginning in the late 60s, San Diego’s right-wing establishment and press had initiated a hate-campaign against Marcuse resulting in a forced early retirement.) Years later, Marcuse would take part in discussion groups in OB at a Newport Avenue storefront run by community organizers, a storefront where the OB Rag had its office. But we’re getting ahead of ourselves. All these stirrings had a very direct and definite impact on college campuses, over a wide-range of consequences – from new departments being opened like Black Studies, Womens Studies, to universal acknowledgement that the colleges were underserving minority communities, to massive numbers of students taking up causes and getting involved on their own campuses. Finally, the confluence of all these movements and causes and issues came to a head with the political development of thousands, hundreds of thousands of young people, and it meant the political, philosophical and moral maturation of an entire generation of college students. For thousands, the man behind the curtain had been exposed. Was part of the anti-war movement in LA. Was part of communal house called Ellis Island which this year celebrated its 40th anniversary. Still going strong. We Islanders have an on online chat group. A recent thread recalls attending a protest in Oceanside. We are trying to determine a date, whether it was late 69 or 70 after Kent State. Don’t think it was the December 69 Fort Pendleton march. Any suggestions? A very good early history piece. Will let our group know of your existence. Larry, thanks for coming by. Yes, there was a large Oceanside anti-war march and rally. It had hundreds of servicepeople at the front of the march. It ended up down at the shell at the beach for the rally. Angela Davis spoke. The event was part of the 1969 Moratorium, and I believe it was the 3rd in the series, so I think it was like Dec 69. It was NOT after Kent State. I remember the event like it was last week. I was one of the monitors for the rally and march and remember a police billy club being pressed into my gut as we tried to keep separate the demonstrators and the screaming counter-demonstrators. Thanks and come by again, and again. do you know what I am even talking about?